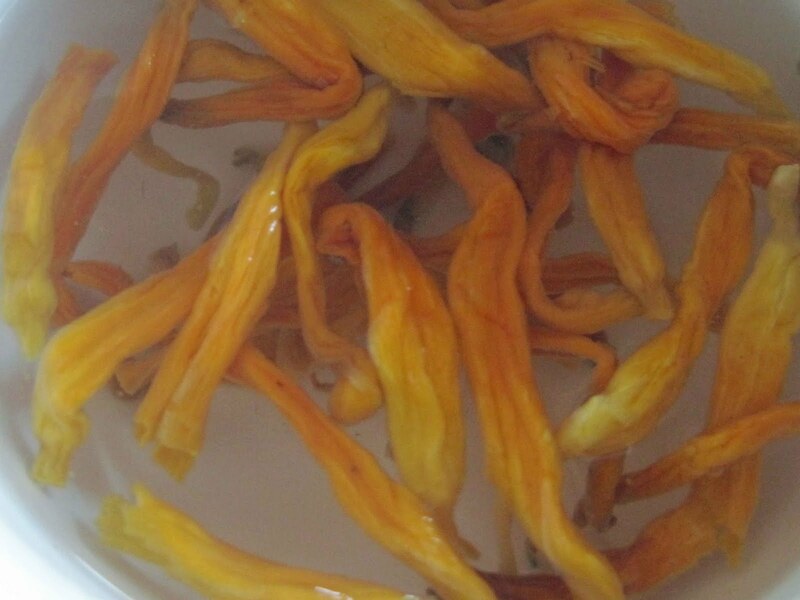 Mother's Day is right around the corner, and that has reminded me of a delightful ingredient that needs a whole lot more attention: golden needles, or jinzhencai. Daylilies in China are sort of like carnations in the States in that they are the traditional symbol of mothers. That is why one of my Chinese painting teachers created the gorgeous fan painting on the left as a present for my mom many years ago. But in addition to being pretty garden flowers, they have a long history as a treasured ingredient in northern, eastern, and Buddhist kitchens. It actually took me quite a while to figure out what exactly these orange shreds were that happened to be floating around in my hot and sour soup, bonding with the lamb shreds in my bowls of Muslim-style bean curd custard, and perking up some otherwise truly monochromatic brown dishes. Some people said that they were tiger lily flowers, and I believed them for the longest time until a friendly gourmet put me straight. 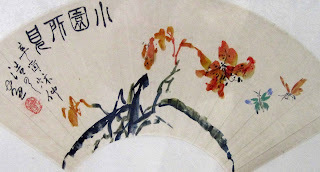 "These," he said, "actually are the buds of the xuancaohua" - my mind darted frantically in search of a translation, and the expression on my face must have been alarmingly obvious because he added - "just like those in this picture here," he said with a smile, pointing at an extraordinarily convenient painting on a wall. Ah... daylilies! Many years have passed since that fateful day, and I still get a grin on my face whenever these colorful blossoms decorate a dish. They're not there just to spiff up the plate, though, because they have a gentle flavor and texture that few other flowers ever could ever aspire to. They therefore bring a lot to the party, and the only difficulty is finding them in a happy condition. 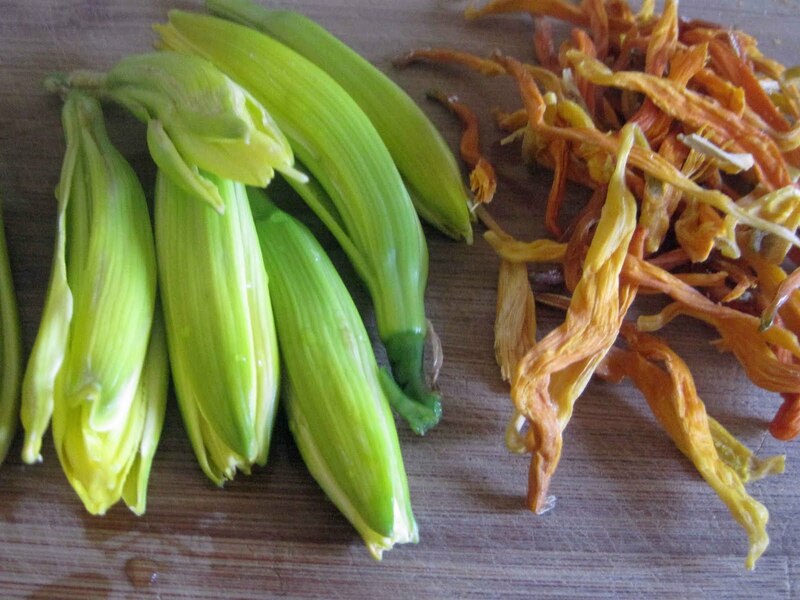 If you are lucky enough to come across a package of dried daylilies in a Chinese grocery, chances are very good that they will be brown and rubbery. Pass them by with a regretful sigh; those flowers have hung around for way too long, have a slightly sour flavor, and will just add more boring brown to your dish. Be on the lookout for super fresh buds that are a sprightly yellow-orange. 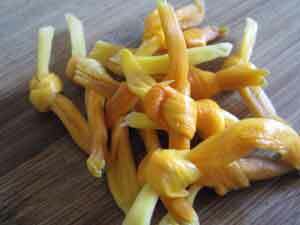 Snap them up whenever you find them and store them in the refrigerator in a sealed bag where they will stay fresh and supple for many months. Or, if you have some of these fragrant, golden, nocturnal Chinese daylily plants handy (known as Hemerocallis citrina), start harvesting them when the the buds turn from green to gold and then use them fresh, dry them out yourself for the colder months, or even freeze them. Be sure that the variety you are planning to eat is actually edible, though, as there is some controversy over which ones should be eaten. To reconstitute the blossoms, just pour hot water over them for a few minutes. They are usually tied into knots at this point, which helps keep them from disintegrating during the cooking process; they are after all just delicate little flowers. So, if you are dexterous enough to tie them into knots, by all means do so; this also adds more texture since the knot gives the blossoms that much more bite, and save any short blossoms to add to some other light soup at the last minute. Buddhist vegetarian cuisine often calls upon these little marvels to add subtle oomph to dishes like this one, which is called Four Happiness Braised Gluten, and I couldn’t think of a better description. Everything about this brings a smile to my face: the aroma, the colors, the textures, and of course the taste. If you are unfamiliar with raised gluten, do give it a try. Gluten doesn't sound that appetizing in English and probably brings to mind that science or home ec project where you kneaded flour into a ball and then washed away all the starch in order to end up with a ball of gluten. But raised gluten is a horse of a different color. It looks and acts more like bread, smells nice and yeasty, and when fried before being thrown into a sauce, it takes on a meaty texture that is really quite yummy. Although wheat gluten has been given short shrift in Western fare, vegetarianism has been a part of Chinese culture for centuries, and a delicious cuisine has developed as a result. Gluten usually can be found in two forms: raised and unraised. The unraised form is wheat gluten powder mixed with water (or fresh gluten kneaded out of bread flour and rinsed clean), while the raised form is simply gluten flour mixed with water and bread yeast that is allowed to rise and then steamed. This second method gives the gluten a honeycomb texture perfect for dishes like this. Raised gluten has a meaty texture and a mild flavor, and its spongy texture allows it to soak up sauces into every crevice. This kind of gluten can be purchased in most Chinese grocery stores, but it spoils easily, so smell it carefully before you use it and discard it if there’s a sour smell. If you are not going to use it immediately, be sure to freeze it. I first came across this Shanghainese dish at a banquet at a Buddhist-style restaurant in Taipei following the first Chinese funeral I ever attended. And it was the most amazing meal. I had never eaten vegetarian food like that before – it tasted like there was meat in most of the dishes, but upon closer inspection the meat turned out to be clever impersonators made from either bean curd or wheat gluten. This really was kitchen artistry at work. The funeral banquet started out sad, but as we recalled our good friend over this great meal, we all started to smile and enjoy our memories, which perhaps was the true purpose of the feast. My good spirits were temporarily shaken, however, when I spied a cat under the next table happily eviscerating a mouse. But to each his own. 1. Tear the gluten into pieces about an inch square or so. Heat about 2 inches of peanut oil in a wok over medium high heat until it begins to shimmer, add the gluten, and stir-fry it until it is golden all over. Remove the gluten to a plate. 2. 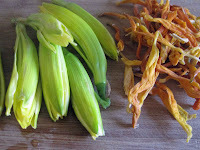 Drain the wood ear mushrooms and tear them into pieces about the same size as the shredded gluten, and slice the bamboo shoot into thin slices, and then cut them crosswise at an angle. 3. 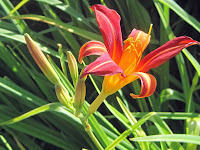 Drain the daylily buds, remove any tough parts, and tie them into knots if they are long enough. If the edamame are frozen, rinse them in a colander under warm water to defrost them. 4. Pour all of the oil out of the wok except for about 3 tablespoons and heat the oil over medium-high heat until it shimmers. Add the green onions and ginger, and stir-fry them for a minute to release their fragrance. Add the mushrooms and bamboo shoot slices and stir-fry for another minute. Toss in the star anise, as well as the soy sauce, rice wine, sugar, and water. Bring it to a boil, add the fried gluten and the mushrooms, and simmer everything for about half an hour; all of the ingredients should be soft and flavorful at this point. 5. Add the lily bud knots and edamame to the wok, stir gently, and cook uncovered for about 10 minutes. The sauce should be thick and glossy at this point. If not, use a slotted spoon to remove everything but the sauce from the wok. Heat the sauce over medium-high heat and stir until the sauce reduces to the consistency of molasses. Return the gluten mixture to the wok and toss everything gently to coat. Taste and adjust the seasoning with more soy sauce, sugar, and sesame oil as needed. 6. Allow the dish to come to room temperature before serving. This can be made up to three days ahead of time and should be refrigerated if not eaten right away.